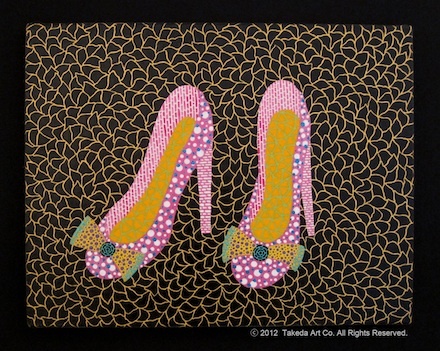 草間彌生展　Yayoi Kusama Exhibition | たけだ美術 Takeda Art Co.
Kusama’s figurative works seem as if they were “High-heels”, “Pumpkin” and “Butterfly” at a glance. 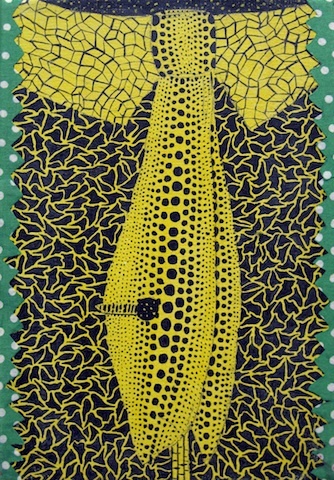 These images,which are recognized as Kusama’s icons, had suddenly emerged in the late ’70s. However, once you cut the face of her work into small pieces something like a jigsaw puzzle, you just see large or small dots and spreading nets with regularity. 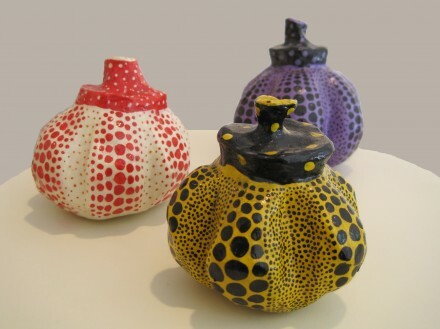 In the ’60s, while stimulating each other in NY, Kusama had influenced every artist in the minimal, the pop and the NY school of art because of her avant-garde works. After returning to Japan, she did not know where to put herself in Japanese art world. She had painted figurative works as she was, in such a hard time. Takeda Art Co. presents the following works which were painted in her prime. 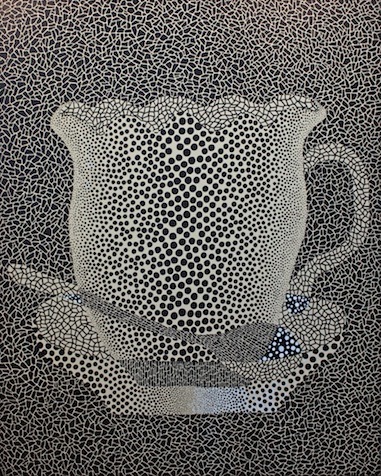 We display “Coffee Cup” of a size 100 in 1980, presented in the first solo exhibition at Fuji TV Gallery in 1982. In addition, we present some 6 or 7 works such as “Dress” and “Necktie” 1982 which are made with a collage. Her some 10 works on canvas, including paintings from in the ’90s to the recent 2000s, are featured. About 10 sculptures of “Pumpkin” are also displayed. We hope that you will enjoy the exhibition.